“About suffering they were never wrong, the old masters,” W.H. Auden wrote in his poem on Brueghel. The words could easily have applied to both the subject and the creator of Andrei Rublev, Andrei Tarkovsky’s 1966 masterpiece. A film about suffering and art, the spiritual journey towards transendence, and the muddy, sodden reality of day-to-day life. It is one of the most profound and moving experiences that cinema has ever conveyed. It begins with a prologue as a man, some Leonardo or Galileo of the Steppes perhaps, takes a giddy flight with a cobbled together hot air balloon. This medieval Icarus rises from the bell tower and soars over the wetlands. Horses run in the distance and men shout up at him from boats. The bladders will leak; his hopes will be crushed, but was that glimpse, that aerial view of life, however brief, worth it? 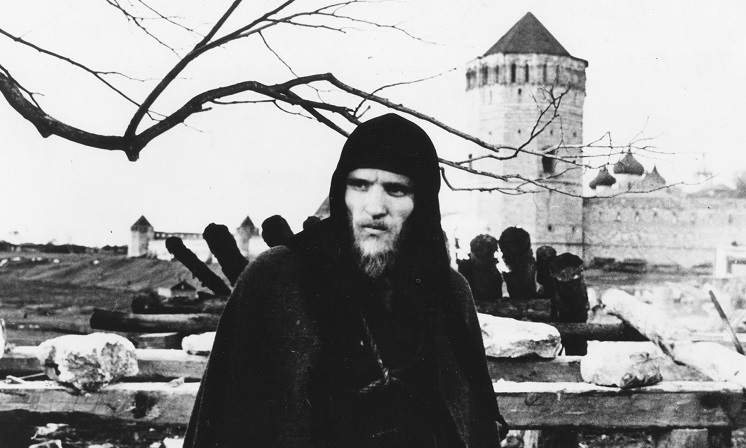 The film proper is structured around a series of titled episodes in the life of the Fifteenth Century monk and icon painter, Andrei Rublev, played by Anatoly Solonitsyn who would go on to feature in all of Tarkovksy’s work until Stalker in 1979 would effectively kill him. Each episode stands as vignette, a panel representing an artist’s Stations of the Cross. Rublev himself is an enigmatic, quiet (ultimately silent) character; a watchful man who absorbs what is happening around him, as much a symbol of the audience as he is of the artist and perhaps film director. And what is happening around him, in the words of Thomas Hobbes, is life: ‘nasty, brutish and short’. A jester, or buffoon as the title card reads (Rolan Bykov), entertains a barn-full of drunken peasants with a ribald song as Rublev and his fellow monks take shelter from the rain. After mocking priests as well, the jester is arrested by a group of soldiers, who were perhaps called by one of Rublev’s confraternity, and led off to torture and perhaps death as the sun comes out once more.